Whiskey is a quintessential Irish drink. Brown in color, sweet and known for its drinkability, Irish whiskey is one of the most popular spirits in the world. 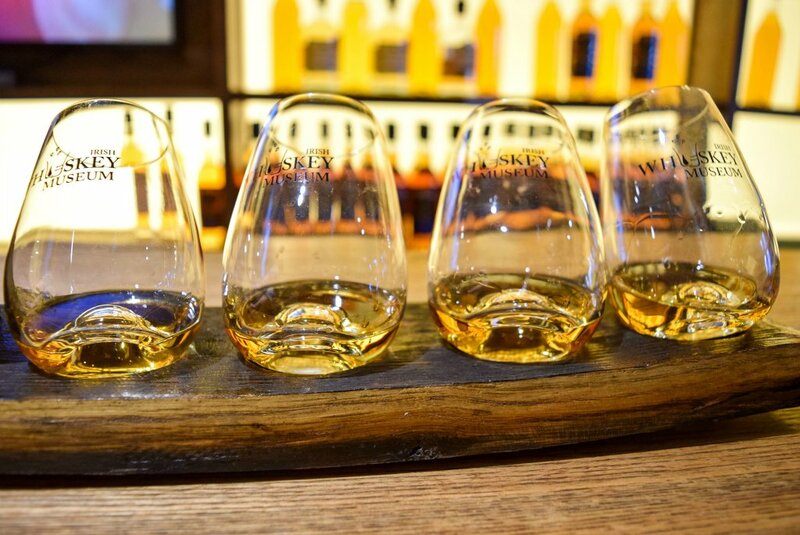 Having said that, if you happen to be in Dublin and are looking to sharpen your whiskey tasting skills, join a whiskey tour at the Irish Whiskey Museum. 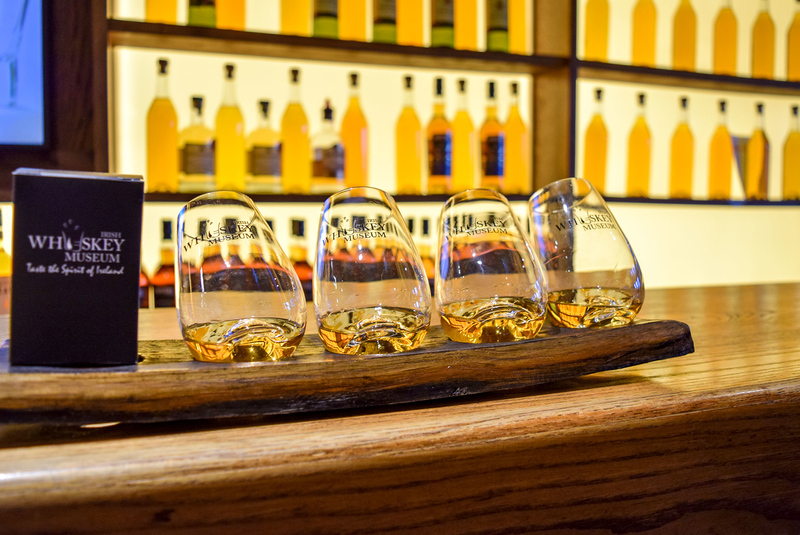 Unlike traditional museums, the Irish Whiskey Museum offers a guided experience that takes you through the history of whiskey in Ireland. 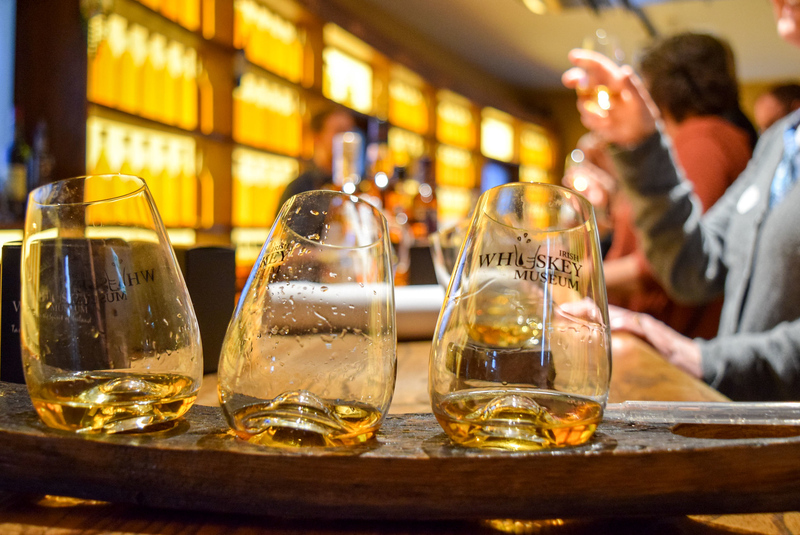 It also immerses you in a whiskey tasting that awakens your senses and matures your palette. Even if you’re not a whiskey drinker, I’m confident that you’ll savor this adventure and learn something new. Since we arrived half an hour before our tour, after checking in, we toured the gift shop and later grabbed seats at the whiskey lounge. The lounge was cozy and featured a variety of spirits including Premium Blended Irish Whiskey, Single Malt Whiskey and craft beer from Galway and Glendalough. 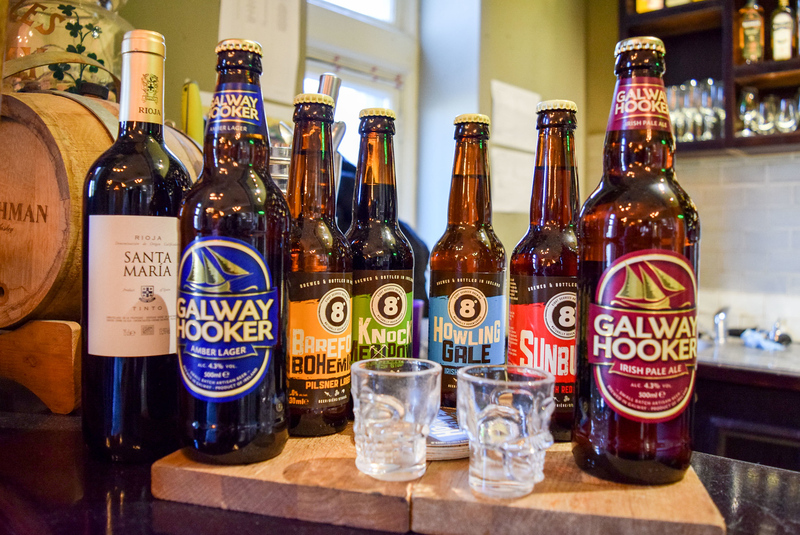 You could also order a “top pick” like Kevs Christmas Spirit (6,00 €), Irish Coffee (7,50 €) or Top Shelf Flight (25,00 €). Speaking of Glendalough, Glendalough is a glacial valley in County Willow (a short drive from Dublin) which is fantastic for reconnecting with nature. After our tour, the bartender demonstrated how to make a delicious Irish coffee which I highly recommend having here while you’re in Dublin! I also have to mention that the Irish Whiskey Museum has impressive bathrooms painted bright red with barn-style doors – I’m taking home decor notes! In no time we followed our tour guide Aaron to the first of the three themed exhibits. Aaron was charming and witty and he kept the tour moving with his fast-paced commentary. Although our tour group was small, it was diverse including locals who lived right outside of Dublin and travelers from The Netherlands, Canada, and Germany. Aron walked us through the history of Irish whiskey and provided a high-level overview of the triple distilling process. Although I heard that there were videos throughout the tour, there were no visual illustrations on my tour. There’s an ongoing debate of who discovered whiskey, the Irish or Scottish. In the end, no one really knows who discovered whiskey but interestingly enough, the first record of whiskey in Ireland predates Scottish records by almost 85 years. In 1405 an Irish Medieval king died of alcohol poisoning from drinking too much whiskey, poor fellow. More than likely though, whiskey was discovered by accident when raw spirits were left in barrels and matured over time. In Gaelic, whiskey means “water of life”. While Scotch whisky requires 3 years of aging, to qualify as “Irish whiskey”, the whiskey must be left in barrels for at least 3 years and 1 day. 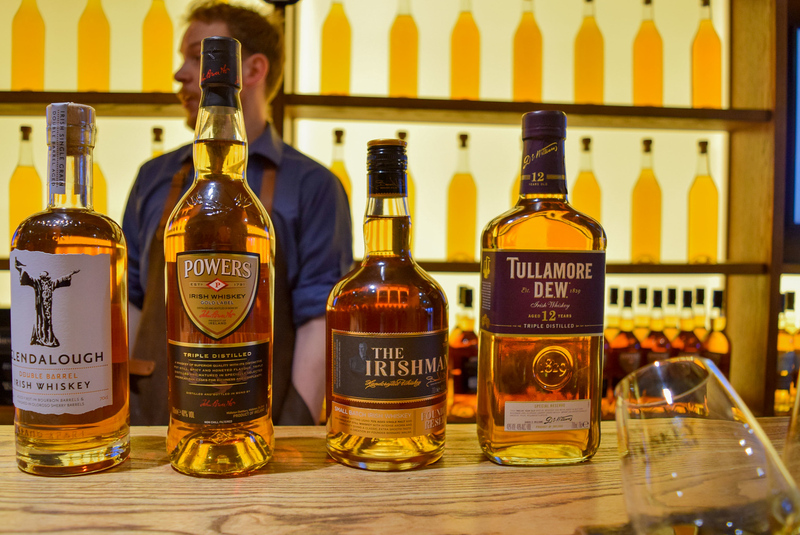 However, since many Irish brands prefer quality over quantity, many Irish distilleries age their whiskey well over the minimum requirement. We’re talking anywhere from 5-10 years. Although this significantly enhances the flavor, about 2% of the alcohol content is lost to evaporation every year, also known as angel share. After learning more about the five major Irish whiskey producers in the 1800s, we were invited to a whiskey tasting in the tasting room. Decorated in bright orange and furnished in dark wood, the tasting room was my favorite room in the entire museum. It was warm and inviting which perfectly mirrored how I felt sipping Irish whiskey. As premier ticket holders, we were given four different whiskey tastings and an Irish Whiskey Museum souvenir which I’ve proudly added to my glassware collection. Each whiskey had a unique taste and after each sample, we noted the smells and flavors as a group. One whiskey had hints of green apple while another smelled of maple syrup. While my friend enjoyed Powers, I enjoyed Jameson for its smooth finish and thick taste. If it’s your first time drinking Irish whiskey, Jameson and Powers are great starters. Powers is the staple for Irish Coffee while Jameson pairs exceptionally well with Ginger Ale. By the way, Irish whiskey brands do not endorse the museum so you’ll never feel pressured to buy anything which is always nice. Overall the whiskey tour at the Irish Whiskey Museum was well-organized and effortlessly took us back in time. The tour was informative and I enjoyed learning about different types of Irish whiskey and how its production continues to shape drinking culture around the world. 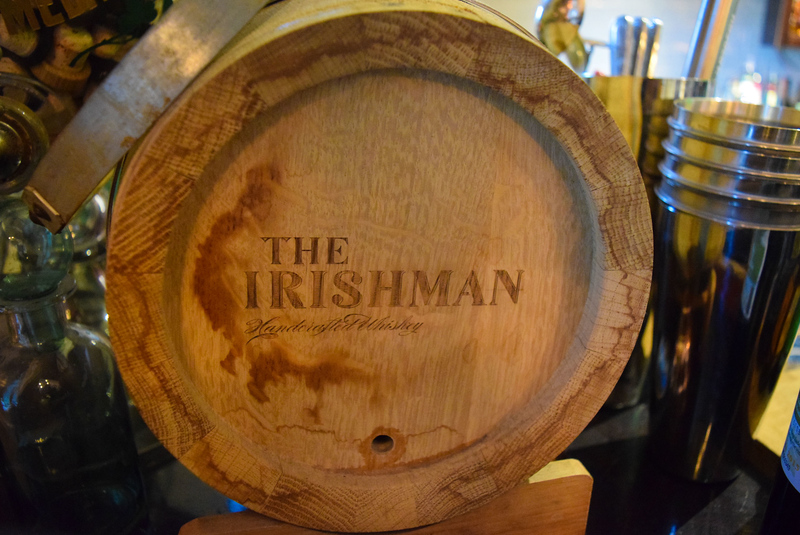 And despite the decline of Irish whiskey during World War I and the American Prohibition Era, it’s great to hear that Irish whiskey is making a comeback. New distilleries are popping up across the country! 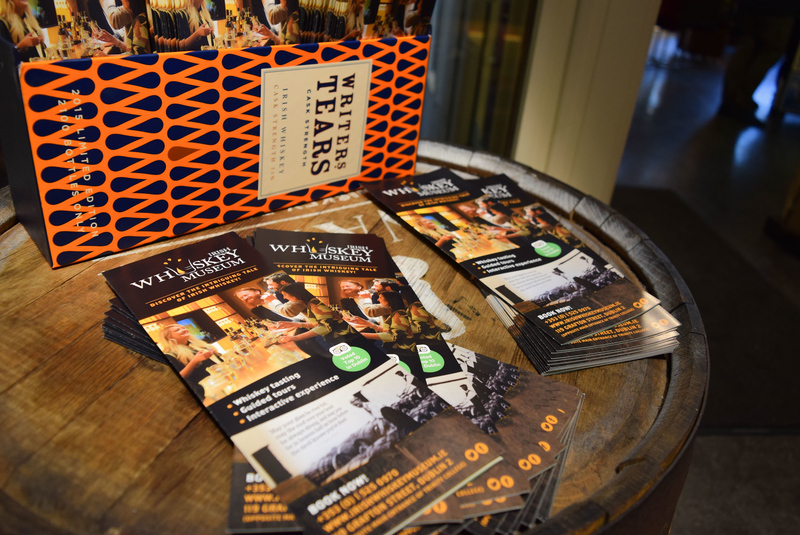 With that being said, there’s no better time to visit the Irish Whiskey Museum and discover how the Irish whiskey story continues to unfold. This is a collaborative post with Irish Whiskey Museum, all opinions are my own.